Call 403-903-6362 for a FREE quote! 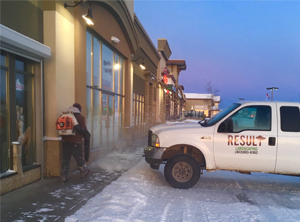 Snow removal services in Calgary starting at just $140.00 a month! Call 403-903-6362 for a FREE quote! 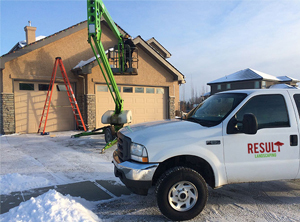 We provide local homeowners and businesses in the Calgary, Alberta area a broad range of services, from excavating to landscaping or simply all-purpose tidying up. Our professionally trained landscapers together with our versatile bobcat equipment, permits us to give our customers tip-top workmanship and service. If you have a proposal, we can turn it into a reality. Our company goal is to care for our customers the way we would like to be cared for, which is courteously and with consideration. We carry out each job with forthrightness and to our customer’s satisfaction. Finding Trusted Landscaping Companies in Calgary can seem like a daunting task but have no fear Result Landscaping will give you that “WOW” factor with a piece of mind. Check out our listings and reviews on Google, Bing, Homestars, Trusted Pros and more to see our happy customers! When searching for landscapers near me give Result a shot and you won’t be disappointed. Our Bobcat machines are idea for any landscaping project you might have. We are capable of digging-out sites for ponds, shift boulders, bark mulch, and lay sod. Moreover, our machines are a convenient size and easy to manoeuvre permitting our landscapers to access miniature spaces without upsetting property. Our landscaping and excavating experience includes everything from small urban residential settings to acreages. We will assist you with obtaining that outdoor living space you want to enjoy. Authorized tree workers and the proper equipment will have your project underway in no time. Our skid-steers with dump trailers makes land clearing and debris removal easy. With our convoy of bins, we can move materials in and out of the work area at your convenience. Forget about waiting for a truck to return, simply fill-up another bin while the truck is away. You can stop wasting precious moments cleaning-up following a job due to the material being stored on the ground. Our service leaves the area nice and clean at all times. If you feel like leaving the shovel and pick, the time is now. With the Bobcat, any labour-intensive shovelling is a thing of the past. Our landscapers get into hard to reach places and dig holes for new trees to be planted. Restricted access is not a deterrent to productivity. We have specially designed tight-quarter equipment. Our excavator can retract its thickness to fit through a garden gate. The roll-bar can be let-down to assist passage through a garage-man door. Time spent prying, pulling or digging those mullish stumps are done. Our stump-grinder will quickly remove them without minimal effort, and without interrupting the surrounding landscape. We are also experts in grading services, including final grading and all rough grading. 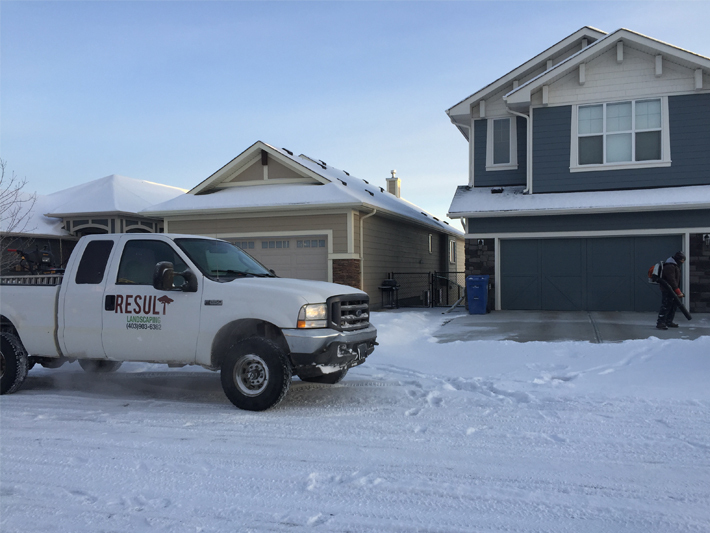 Whether for new residential homes or older homes that have the ground settling around the foundation, we can get the job done. We offer complete landscaping services that cover landscape design from coarse and final-grading to the installation of shrubs, trees, and sod. 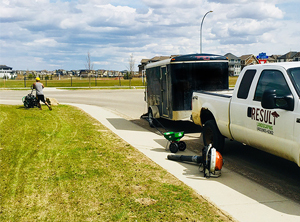 Whether you are beginning from nothing or sprucing up your yard, looking for general lawn care services, needing spring clean up, fall clean up, or weekly lawn care, feel free to contact us for the best service of any landscaper around Calgary area. We will weigh up your needs and configure our equipment to line-up to meet them. Because we are highly qualified to run our equipment, we will make sure to complete the job on time and on budget. My mother lives in a seniors community and has had such a tough time with contractors in the past. She has even fallen twice because of there lack of workmanship. These past two years we have had result landscaping dealing with them and have had no issues! Please keep up the good work. I had the guys come out and do a spring clean up for me. For the price and quality of work it was well worth it. The employees were very polite and got the job done fast. I will be calling these guys next year! Amazing professionalism and workmanship. Efficient! Highly recommend. Great job on my lights and a great group of boys. Great job! Had Result out for my Christmas lights and they did a great job. Got the blue color and they are beautiful. Thanks for making our Christmas! Thank you for the care, and cleanliness. You really respected our property and neighbours. We provide landscaping and snow removal services in Calgary and surrounding area. Contact us today for your free quote! 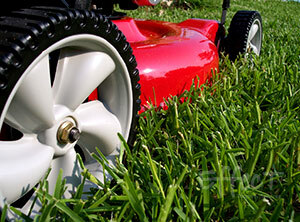 Contact Result Landscaping today for a FREE quote!